Housing is offered as units with an optional kitchen, bedroom and a living room and several include a daily continental breakfast. Each student has one unit and no sharing of units is required but sharing hotel suites is an option to reduce cost. Transportation takes the student to and from class and scheduled trips to the grocery stores. 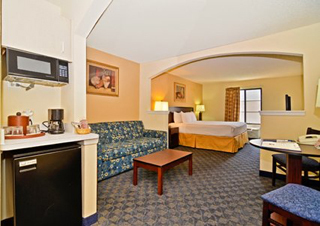 The pricing is based on hotels such as Comfort Inn and Suites, Holiday Inn and Suites or similar. These are some pictures from the suites offered to our students. The cost for these hotel suites are between $55 to $129 per night for single occupancy, and $30 to $65 per student for sharing a room. 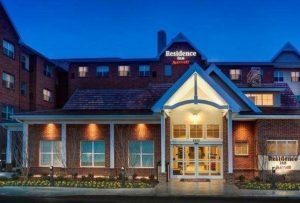 Several include a free daily breakfast, and all include a free scheduled shuttle service. Off-site studio suites with kitchenettes including a refrigerator and a bedroom are available from $55 and up. All off-site accommodations provide a complimentary shuttle service to and from the school and local stores and entertainment. 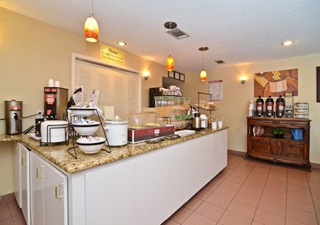 Several provide a free daily breakfast and an afternoon social/happy hour. Students may share a room from $30 to $65 per night if a roommate is available. Please call or email IFOD for details. NOTE: If you stay in one of our hotels for more than 30 days consecutively, all taxes and fees for the hotel are excluded. Includes transportation and free daily breakfast. Includes daily breakfast and transportation to and from IFOD and DFW airport. Includes transportation to and from IFOD and DFW airport.